Brady Anderson of Solutions Digital Marketing, LLC, provides online marketing services, which include social media, advertising, online reviews, content and search engine optimization for small to medium-sized businesses and professionals. Brady has over 8 years experience in digital marketing and 16 years in advertising and traditional marketing. He consults with his clients with the perspective of having worked with many business owners in multiple industries. Brady strives to understand the goals and challenges of each of his clients, and works closely with each of them to form a strategy that meets those goals, and overcomes the challenges. Brady originally hails from the DFW Metroplex in TX, and currently lives in Edmonds, WA with his wife, Jennifer, and teenage son, Joshua. He enjoys singing in local acapella groups and karaoke around the Seattle area. Brady Anderson, Founder of Solutions Digital Marketing (www.solutionsdigitalmarketing.com) joined us to discuss LinkedIn to help us better understand how it can be used. LinkedIn was founded in 2002 and launched in 2003. It is a professional social network with 500 million+ members where you can manage your professional identity, build and engage with your professional network and access knowledge, insights and opportunities. It was acquired by Microsoft in 2016 for $26B. Recruiting and Job Search – it is best to keep your background up to date on your LinkedIn profile. Employers often look at your background on LinkedIn first so it should be kept as up to date as possible. Consider it your on-line resume! LinkedIn is both an active and passive tool for identifying potential employees. Professional Networking – Relationships should be a constant in your professional career, constantly networking to develop and enhance your network and professional relationships. Content sharing – LinkedIn provides an avenue to share articles and information you find meaningful. Consider the quality and relevance of the information you send out as well as the frequency (do not wear out your welcome). Sales & Marketing – Possible between 10-25% of the content you send out or post can be related to selling your products or service but Brady feels you do not want to be too aggressive in your efforts in this area. LinkedIn also offers programs where you can pay for advertising, sponsor content and send text ads. In addition, for a subscription fee or a cost based on number of transactions, you can send out “InMail’s” (messages to people) outside of your network for sales and marketing purposes. When using LinkedIn, it is important to understand what not to do! This is not Facebook – it is professional and business oriented! Avoid politics and inappropriate content. Be professional and not too salesy. Howard Johnson led us in the invocation and Tanya Franzen-Garrett introduced our visiting Rotarian, Kemper Freeman. Two Sammamish Students of the Month were introduced: Ana Espindola is BBRC Student of the Month for January 2019 (Tanya Franzen-Garrett) and Dasha Zotov for February 2019 (introduced by Eli Enger). Congratulations to both! Jeff Cashman introduced some new Paul Harris Fellow recipients but not all were at the meeting. Brad Baumann is to be congratulated as he is taking on a new role (a promotion) with Banner Bank. Unfortunately, he will be leaving our club as he and his wife Tina will be moving to Walla Walla. Brad will be missed! Wendi Fischer led a round of Happy Bucks and did a roll call on the longevity of our club members – how many years in BBRC! Ann Norman and Robin Callan discussed the Dine Around and all were hopeful that the weather would cooperate. And Dustin Walling reminded us all to sign up on the volunteer website for the AI4A Walk Run on April 29! The meeting was adjourned by President Chris Boland at 830 AM. 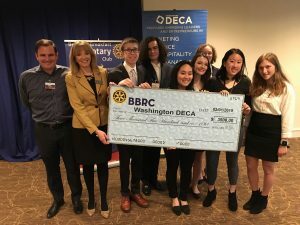 BBRC makes a $3500 donation to Washington DECA team at our weekly meeting. Our members also had the pleasure of hearing from three DECA high school chapters (Newport, Interlake and Lake Washington) present their business plans. We are thrilled that Rotary is aligning with entrepreneurs amongst our younger community members to make a difference. The Bellevue Breakfast Rotary Club is pleased to announce Katherine De Stephano, owner of Escape Outdoors, as the recipient of the 2019 All in for Autism Leadership Award presented by Claudia Balducci, King County Council member. 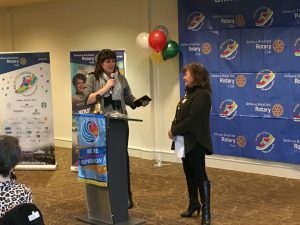 The All in for Autism Leadership Award is presented in recognition of Katherine De Stephano’s outstanding contribution to the Bellevue Breakfast Rotary club’s efforts to support Autism organizations and other programs that benefit the local Bellevue community. The Bellevue Breakfast Rotary Club (BBRC) organizes the All in for Autism 5K/10K Run/Walk in Bellevue in April each year. Now in its 13th year, this event has become Bellevue’s premier running event that caters to enthusiasts and families alike and has successfully attracted over 2,500 people. The event raises over $125,000 each year, thanks to the sponsorship and long term support from local organizations such as Escape Outdoors, The Bellevue Collection, Starbucks, Amazon and the City of Bellevue. Funds raised from this event supports Autism and other Rotary programs and organizations that benefit children and families in the Bellevue community and internationally. Kindering will continue to be the primary beneficiary of this year’s event. both with her time and financial commitment to support the causes and programs of the BBRC. Katherine De Stephano and Escape Outdoors, a boutique with 4 stores in the Pacific Northwest and tenant of The Bellevue Collection, has sponsored over $35,000 for this event over the years. In the early years of the All in for Autism event, Katherine played a key role to grow the event with her leadership, and brought the community of businesses and residents together to make the event a premier running and family friendly event in Bellevue and raise awareness for Autism and other programs of the BBRC. “I am delighted to present the All in for Autism Leadership Award on behalf of the Bellevue Breakfast Rotary Club to Katherine. Katherine and Escape Outdoors personify our deeply rooted ties to the Bellevue community, particularly through her partnership with the BBRC to give back and enhance the vitality of our ties to the local community to prosper together,” said Claudia Balducci, King County Council member.